Indietracks - an indiepop festival: Fancy running an activity workshop at Indietracks? Fancy running an activity workshop at Indietracks? Fortuna Pop! supremo Sean Price enthralls a tent full of people keen to learn how (not) to run a record label! One of the many, many things we love about Indietracks is the wonderful workshops run by talented volunteers each year. There is always a range of brilliant activities for both children and adults, and in previous years we have made jewellery with Tatty Devine, got crafty with Craft Guerilla, learned how (not) to run a record label with Fortuna POP!, made stop motion animation films and even played indie pop Guess Who! We're really keen to run workshops again this year, so please do get in touch if you're interested in getting involved. 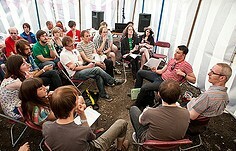 You will be able to run your workshop in a designated tent and - of course - you will have a free ticket to the festival. The deadline for workshop applications is April 29, and we will contact successful applicants shortly after that. - Have you run a workshop before? - Will you charge for your workshop? - Have you been to Indietracks before? Any interesting stories to divulge? Please be creative with your application as we are looking for new and exciting workshops at the festival. We are particularly looking for new workshops, but will accept applications from previous workshop co-ordinators too. You must provide all materials to run the workshop with - Indietracks has nothing! You can charge for people to participate in the workshop but it must be cheap (less than £5) and the money should only be used to cover materials and not be your beer or travel money! There are two weekend festival passes per workshop. You will be able to sell your stuff on a stall at the festival over the weekend. We charge a standard merchant fee for a stall. Details on costs and the application process are available on request. Please note we are keen to keep the workshops child-friendly and we are open to suggestions for workshops specifically aimed at children too. There have been increasing requests for non-craft based workshops, so we are hoping to vary the schedule more this year.